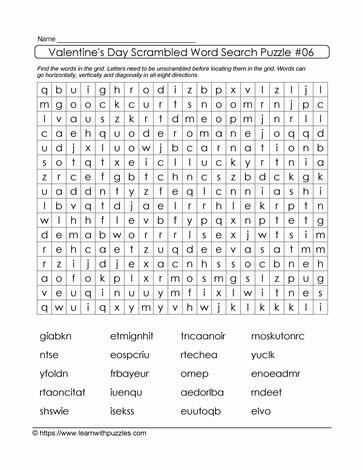 How can Educators use word search puzzles as assessment tools? Word search puzzles give educators a tool to help identify learning gaps and next steps for students. For example, this Valentine's Day word search puzzle includes the list of theme words, but the words have their letters scrambled. For students to solve the puzzle they need to unjumble these letters first. Educators can observe students' behaviors as they work to solve this mind teaser. Are students struggling to decode or unjumble the letters? Do students have the base knowledge of these theme related words in order to solve the brain teaser? How quickly are some students able to solve the puzzle compared to other students? Through observations and asking questions, educators are able to assess possible learning gaps and next steps in their instruction.